Originally fossils only provided us with relative ages because, although early paleontologists understood biological succession, they did not know the absolute ages of the different organisms. It was only in the early part of the 20th century, when isotopic dating methods were first applied, that it became possible to discover the absolute ages of the rocks containing fossils. In most cases, we cannot use isotopic techniques to directly date fossils or the sedimentary rocks they are found in, but we can constrain their ages by dating igneous rocks that cut across sedimentary rocks, or volcanic ash layers that lie within sedimentary layers. Isotopic dating of rocks, or the minerals in them, is based on the fact that we know the decay rates of certain unstable isotopes of elements and that these rates have been constant over geological time. It is also based on the premise that when the atoms of an element decay within a mineral or a rock, they stay there and don’t escape to the surrounding rock, water, or air. One of the isotope pairs widely used in geology is the decay of 40K to 40Ar (potassium-40 to argon-40). 40K is a radioactive isotope of potassium that is present in very small amounts in all minerals that have potassium in them. 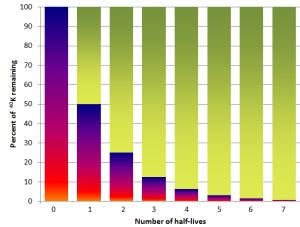 It has a half-life of 1.3 billion years, meaning that over a period of 1.3 Ga one-half of the 40K atoms in a mineral or rock will decay to 40Ar, and over the next 1.3 Ga one-half of the remaining atoms will decay, and so on (Figure 8.14). In order to use the K-Ar dating technique, we need to have an igneous or metamorphic rock that includes a potassium-bearing mineral. 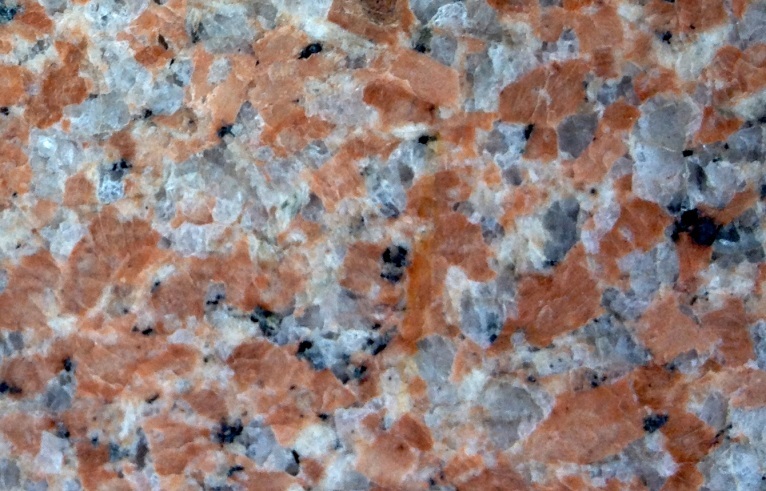 One good example is granite, which normally has some potassium feldspar (Figure 8.15). Feldspar does not have any argon in it when it forms. Over time, the 40K in the feldspar decays to 40Ar. Argon is a gas and the atoms of 40Ar remain embedded within the crystal, unless the rock is subjected to high temperatures after it forms. The sample must be analyzed using a very sensitive mass-spectrometer, which can detect the differences between the masses of atoms, and can therefore distinguish between 40K and the much more abundant 39K. Biotite and hornblende are also commonly used for K-Ar dating. Why can’t we use isotopic dating techniques with sedimentary rocks? An important assumption that we have to be able to make when using isotopic dating is that when the rock formed none of the daughter isotope was present (e.g., 40Ar in the case of the K-Ar method). A clastic sedimentary rock is made up of older rock and mineral fragments, and when the rock forms it is almost certain that all of the fragments already have daughter isotopes in them. Furthermore, in almost all cases, the fragments have come from a range of source rocks that all formed at different times. If we dated a number of individual grains in the sedimentary rock, we would likely get a range of different dates, all older than the age of the rock. It might be possible to date some chemical sedimentary rocks isotopically, but there are no useful isotopes that can be used on old chemical sedimentary rocks. Radiocarbon dating can be used on sediments or sedimentary rocks that contain carbon, but it cannot be used on materials older than about 60 ka. 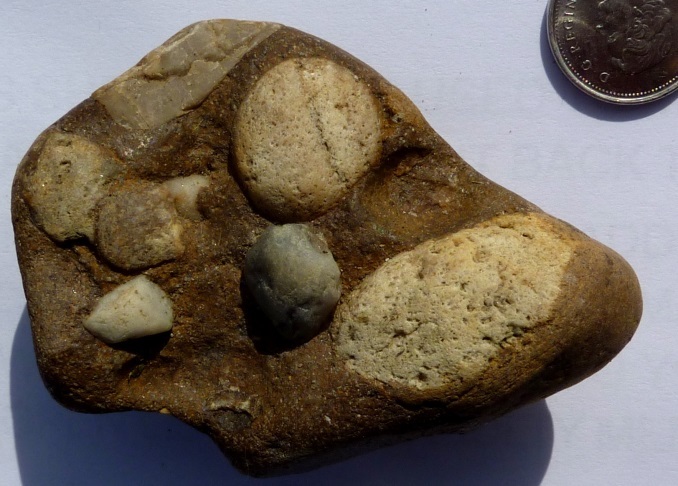 Assume that a feldspar crystal from the granite shown in Figure 8.15 was analyzed for 40K and 40Ar. The proportion of 40K remaining is 0.91. 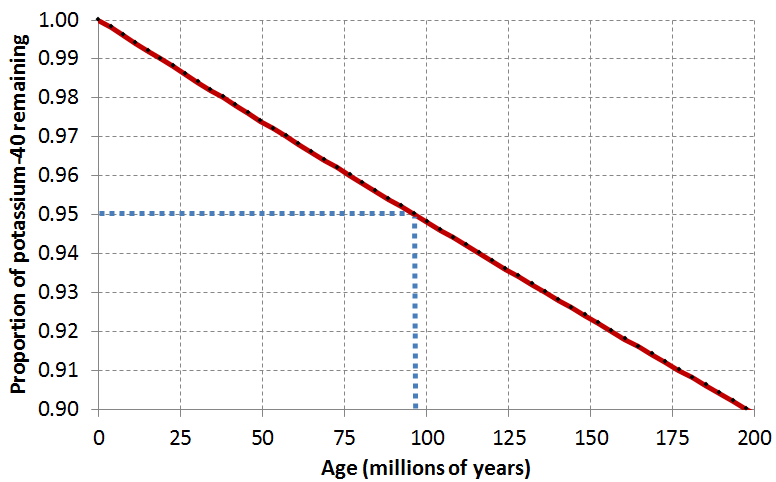 Using the decay curve shown on this graph, estimate the age of the rock. K-Ar is just one of many isotope-pairs that are useful for dating geological materials. Some of the other important pairs are listed in Table 8.2, along with the age ranges that they apply to and some comments on their applications. When radiometric techniques are applied to metamorphic rocks, the results normally tell us the date of metamorphism, not the date when the parent rock formed. Radiocarbon dating (using 14C) can be applied to many geological materials, including sediments and sedimentary rocks, but the materials in question must be younger than 60 ka. Fragments of wood incorporated into young sediments are good candidates for carbon dating, and this technique has been used widely in studies involving late Pleistocene glaciers and glacial sediments. 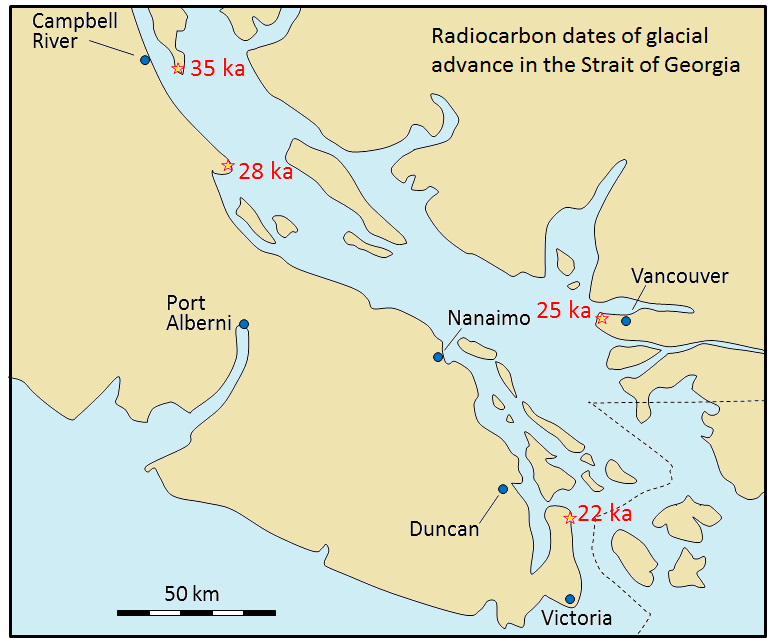 An example is shown in Figure 8.16; radiocarbon dates from wood fragments in glacial sediments have been used to estimate the time of the last glacial advance along the Strait of Georgia. 8.4 Isotopic Dating Methods by Steven Earle is licensed under a Creative Commons Attribution 4.0 International License, except where otherwise noted.